An automated infrared sensor system tells farmers when plants are thirsty or hotter than their ideal growing temperature and need cooling off with irrigation water. Photo courtesy of SmartCrop. Beginning this crop season, farmers will be able to receive text messages on their cell phones from their plants saying whether they are thirsty or not. Accent Engineering, Inc., of Lubbock, Tex., developed the SmartCropTM automated drought monitoring system based on a patent held by the Agricultural Research Service (ARS). They are offering it for sale in time for this growing season. 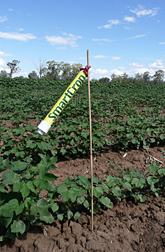 Battery-operated infrared thermometers placed in irrigated fields monitor leaf temperatures and relay that information to a computerized base station. A cell phone modem can be hooked up to the base station to download data to a personal computer. This modem can also send text messages to a farmer's cell phone. ARS plant physiologist James Mahan at the ARS Plant Stress and Germplasm Development Research Unit in Lubbock is one of the original theorists of the idea behind SmartCropTM. Each plant species has a fairly narrow range of internal temperatures it prefers for best growth. When leaf temperature goes above the upper limit or threshold of that range for too long, the plant needs water, as much for cooling down as to quench its thirst. In the Texas High Plains area, for example, Mahan found that cotton begins to suffer from drought if cotton plant leaves stay above 82 degrees Fahrenheit for more than 6-1/2 hours. Farmers can choose the time-temperature threshold at which they would like to receive an alert, and adjust it at any time.